It appears that our field season in Kansas is about finished for the year. Last week Mike Triebold, Jacob Jett and I went out to Gove County to explore in the lower Niobrara. Collecting was pretty sparse, Jacob and I dug a fairly sizable dry hole looking for the source of a mosasaur. We also collected the partial skull of a very small Tylosaurus that Mike found. Mike also found some fish material and a chunky Pteranodon wing. Jacob's typical luck held up. I wouldn't call it a bust with those results, but luckily I stumbled across a very rare fish skull that made the whole trip worthwhile for me. Martinichthys is a strange plethodid fish with a characteristic blunt rostrum. Prior to this field season only 2 relatively complete skulls were known. In June I discovered RMDRC 10-024 from around MU 6, which I was excited about. This trip I found RMDRC 10-031 from slightly lower, right on MU 5, thereby doubling the known specimens. 10-031 is interesting because not only does it preserve the skull, but also vertebrae and epineurals. Below are both skulls. They may not look very pretty, but we're excited about them here! A great year for this new fish. Recently Dr. Johan Lindgren of the University of Lund, Sweden visited our lab to look at our mosasaur collection. He has just published a paper with colleagues on soft tissue preservation in the mosasaur Platecarpus from western Kansas, available here. I had noticed some non-descriptive"smears" around the skull of our Tylosaurus nepaeolicus specimen "Tracie" RMDRC 08-002 while preparing it, and thought it warranted further investigation. We removed the specimen temporarily from display and I brought it into the clean room for further preparation. This was important so that I could shut off the lights. Why on earth would I want to do that? Simple: The phosphatized remains of mosasaur skin will glow under blacklight! They are much more visible than under natural light and it makes preparation easier. Preparation was fairly difficult, but we may have discovered the first skin preserved from the head region of a Tylosaurus ever. I'm currently writing a paper on the preparation techniques involved, so stay tuned for updates soon! I've just been sent a copy of Gregory S. Paul's new book, The Princeton Field Guide to Dinosaurs! The 320 page hardcover volume is jam-packed with over 600 illustrations of over 735 different types of dinosaurs, many of which even I have not heard of before. Skeletal reconstructions are supplemented with color pencil illustrations and in a few cases stunning environmental reconstructions. I must admit there is a huge amount of information packed into this book, and even a hyper-dino-nerd like me has not had a chance to read every single word of it yet. Luckily it is very heavily illustrated, for those of us that cheat by looking at pictures. The book begins with a 65 page section of text and illustration covering dinosaur research, anatomy and biology. After that it dives headlong into the dinosaurs, arranged by type. Not surprisingly the theropods are first. Each species of dinosaur is listed with a brief description giving their size, how much of the animal is known, distinguishing characteristics, age, distribution and some special notes. 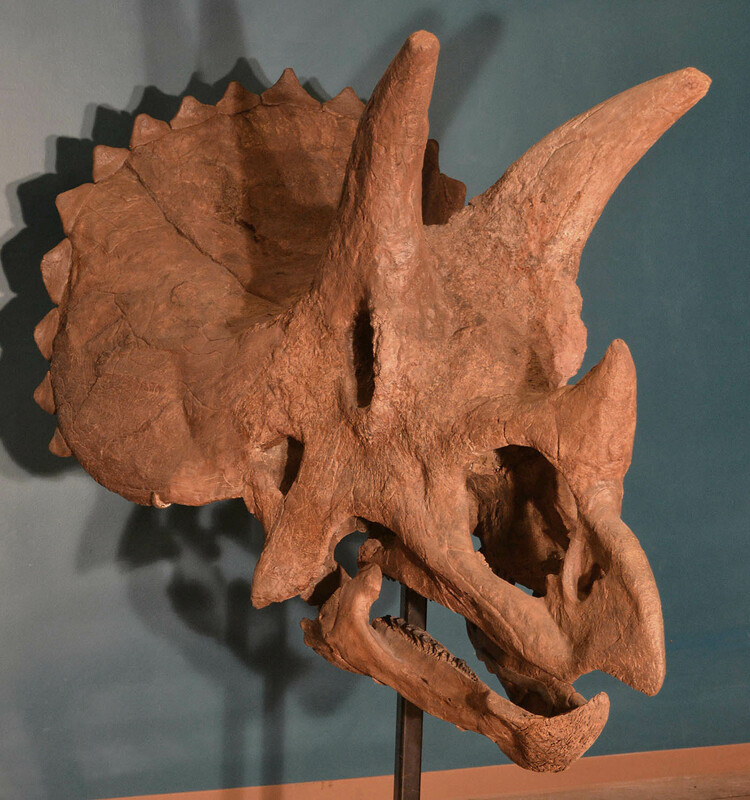 Several of TPI's dinosaur specimens are illustrated including "Sandy" the Pachycephalosaurus and "C1/C2" the unnamed North American oviraptor now housed at the Carnegie Museum. Paul takes some liberties with the taxonomic assignments, seemingly destroying some types of dinosaurs and ruining people's childhoods in the process, however this is a general interest book, not intended for use by scholars. Parents with children interested in dinosaurs may have to spend some time explaining what happened to Lambeosaurus, Torosaurus or even Daspletosaurus. And then there is the seeming revival of Brontosaurus, an issue that sometimes makes me want to pull out what little hair I have left! On the bright side there is elimination of Opisthocoelocaudia, so at least we don't have to stumble through that name anymore. Would I recommend this book? Most certainly! It is leaps and bounds better than the stuff I had available to me as a child, and it would have kept my interest for days on the first read-through. The price is right too at $35.00, and can be found online for even less. If you're a parent that has a dino-lover in the family, this would make an excellent holiday gift!